One of the first mods many people do to a bike is a tail tidy, so we thought it fitting to bring you this tutorial, using the Motodynamic kit on our 2016 Ducati Hypermotard 939 SP project bike. You may be wondering why manufacturers put those elongated fenders on the back of otherwise attractive bikes in the first place. The answer is because it’s the law. Most countries/provinces/states require the motorcycle’s license plate to be located rearward of the bike’s back tire. In the olden days, bikes had much larger fenders, so making the plate location legal was less of an aesthetics issue and all was well in the world. Today’s sport and naked bikes in particular tend to have short tails and as such, force designers to “tack on” plastic extensions to keep everyone happy when it comes to regulations. The stock tail section on the Hypermotard 939 SP which houses the turn signals, license plate and requisite license plate light. The good news is that many OEM’s realize that customers are going to do away with the stock bracket immediately and have designed them in such a way that they can easily be removed. 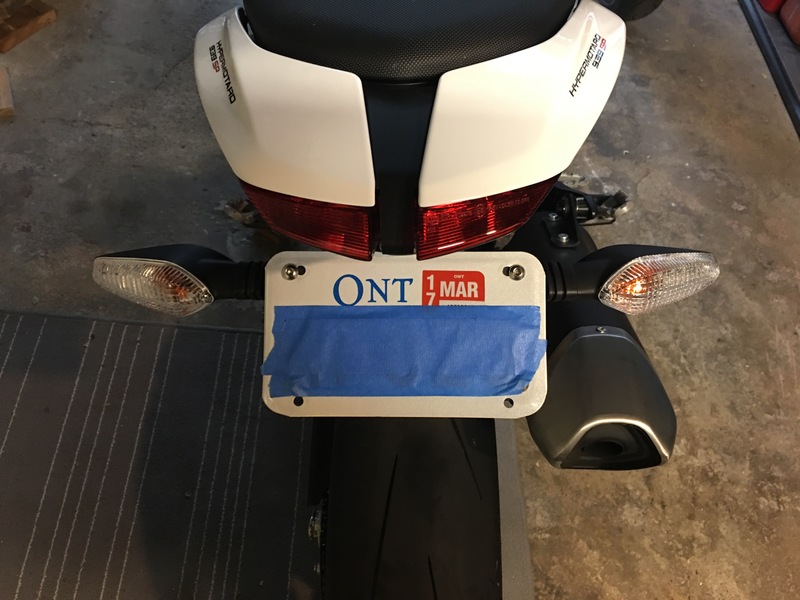 *It’s worth noting that relocating the license plate may be illegal in certain parts of the world, so best to check your with your local regulatory body before undertaking this type of modification. There are just 4 easy-access bolts holding the stock license plate bracket. Thanks Ducati! In the case of our Hyper 939 SP, the faux-fender is simply held on by 4 hex bolts under the tail. Pulling those releases the fender, turn signals and license plate light in a single assembly. The turn signals and license plate light all have quick connects and are easily removed. The Motodynamic tail tidy is compatible with the stock turn signals (we may fit some LED turn signals at a later date but the stock ones are fine for now). For now, removed the signals so that they could be mounted on the new bracket. The Motodynamic tail tidy is a simple piece of kit, featuring black powder coated steel hardware and stainless mounting bolts. There is no cutting required if you re-use the stock turn signals which is nice if you ever need to return the bike to stock trim. What’s included in the tail tidy kit. 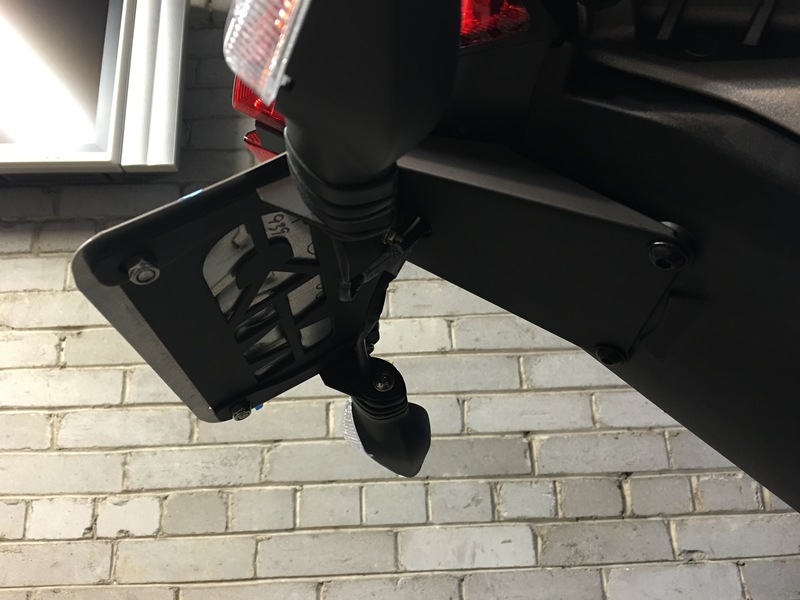 Next: We attached the signals to the plate holder and mounted the LED license plate light. The completed assembly is now ready to be wired up, using the stock connectors. We had to drill new holes in the license plate to get the right fit. The assembly mates to a mounting plate which uses the same 4 mounting points from where we removed the stock bracket. Wiring is tucked away underneath the mounting plate for a clean look. Note that you can re-use the OEM bolts (which are black and more inconspicuous under the tail) if you prefer them to the shiny steel ones provided in the kit. The resulting tail is, well…tidy! Total install time was less than an hour and we were impressed with the quality of the kit for the price (<$100 CDN). We’re happy to help you with any aftermarket mod projects, from the most basic to the more advanced. Subscribe to our blog (below) or follow us on Facebook for the latest news.